Lawrence “Buddy” Mayne (Daddy Paw), 76, of Gray, was called home to his Lord and Savior on Saturday, February 2, 2019. He was surrounded by his family and his beloved wife of 56 years at his side. Funeral services will be held at 11:00AM Wednesday, February 6, 2019, at Calvary Baptist Church with The Reverend Danny Mundy and Corey Greene officiating. Burial will be in Cedar Ridge Cemetery. The family will greet friends one hour prior to the service at the church. Mr. Mayne was a member of Calvary Baptist Church for 24 years. 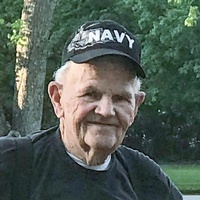 He was a veteran of the U. S. Navy, serving 4 years in the Vietnam War. He worked as a mechanic and a truck driver most of his life. Buddy’s passion was cooking and had cooked for church functions for 20 years. Mr. Mayne is survived by his wife, Ann Mayne of Gray; children, Mardi Kent (Wyndell), Nancy Bass (Mark), Lawrence Mayne Jr., (Chris), Laurie Owens (Cody); grandchildren, Corey Greene, Amanda Moore, Joshua Greene, Holly Beard, John Mayne, Victoria Nolan, Joshua Kent, Colt Kent, April Williams, Rebecca Woolums, Brittany Harvey, Andy Stark; 15 great grandchildren; and sisters, Elaine, Shirley, and Nancy. He was predeceased by his parents, John E. and Evelyn T. Mayne. Hart’s Mortuary, Jones County Chapel, has charge of arrangements.